The Pedax Twinmaster 20, available from Precision Metal Group is a new automatic twin-strand production line with a high output of wire diameters from 10mm up to 20mm. 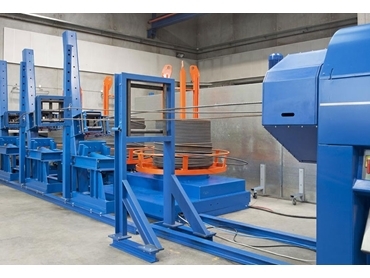 Featuring an advanced and powerful system as well as a robust frame construction, the new production line processes both single strand coils of up to 20mm diameter and double strand of up to 16mm. Equipped with servo-technology in all functions, the Pedax Twinmaster 20 servo-driven double-bender delivers several benefits including maximum performance, energy efficiency, low-noise production and low maintenance costs. The Pedax Twinmaster 20 features two bending heads equipped with two clamps, which hold the wire in a secure position during the bending process. A powerful pre-straightening mechanism is installed as standard to ensure safe feeding of reinforcing steel with a diameter of 20mm. A wire change magazine is also provided as standard.